I am so incredibly grateful to Point of Return who are so knowledgeable, honest and kind. I am now free from drugs thanks to this program and look forward to paying it forward and helping others in their journey to loving themselves once again. - Provide the Tapering prescription per Point of Return guidelines. Your doctor may consult with us. The science is complex but our philosophy is simple: Feed the Brain; Support the Immune System; Relieve Stress and Assist in Natural Sleep. We want you to Feel Better For Life! The Point of Return medical and service team has decades of experience assisting with the unique medical and emotional challenges of addictive medications. Our holistic approach to treatment considers the impact on the whole person while they slowly taper under our guidance from their home. Our team has survived psychoactive drug withdrawal and healed completely. Read more about our team. more. Point of Return has had extensive media coverage on television, print, and radio. more. We have helped people in 76 countries and every state of the United States. more. Symptom relief is essential both during the taper and after the last drug. We are all about a Natural Approach. more. Dependence to Antidepressants is very misunderstood and poorly addressed in the medical community. Most have no idea what a brain zap is, or how incomprehensible it can be to imagine a life without an antidepressant. The way in which other addictive drugs are eliminated from the body cannot be applied to coming off Antidepressants. Slow taper rates must be implemented so the Serotonin receptors can readjust at each level of the taper. Symptoms must be controlled or even a slow taper is too challenging for most to achieve. Too many items interact with Antidepressants and wonderful herbs, vitamins and many over-the-counter items can increase symptoms tremendously. Even Turmeric, an anti-inflammatory and widely used plant, can actually increase the blood levels of an Antidepressant to dangerous levels. We know the concept of being able to get off an antidepressant seems impossible. Its not, you can heal and actually heal. You can engage life, laugh again, feel alive and present. You can make it - Let us help you recover... a slow taper with all-natural items to control symptoms throughout the process and help your body heal; and of course our skilled, kind, compassionate team is with you every step of the way to ensure you make it as we have. 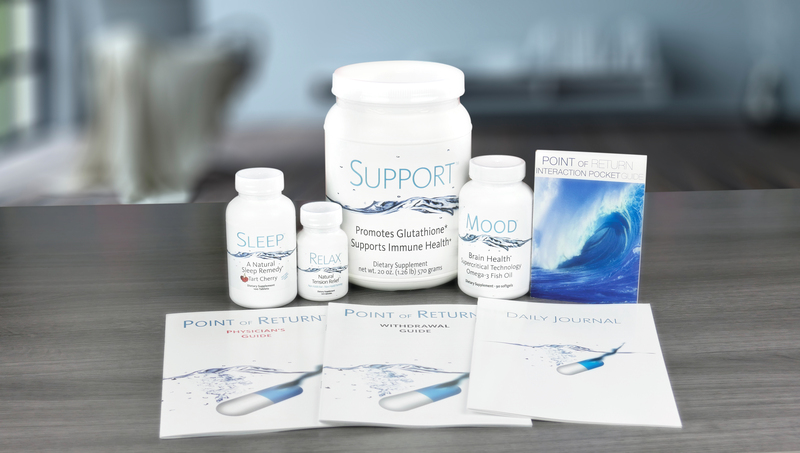 Point of Return is a program implemented at home to escape antidepressant dependence. It’s a collaborative effort between Point of Return, You, Your Doctor and Pharmacist. The program also includes a copy of our co-founder's book, Take as Directed - a riveting chronicle of her struggle with benzodiazepine, sleeping pill and antidepressant dependence. POINT of RETURN - withdrawal guide outlining; tapering schedules, nutritional support, interactions items and much, much more. I am grateful beyond what words can truly express! I can now say that I am PAXIL FREE! Thank you!! The return of joy and happiness in my home makes me confident that you too will find hope at Point of Return. More.. Without God's help and POR whom God used as an instrument, I will not be here telling my testimony. *Because prescription medications can cause severe withdrawal reactions, do not stop taking any medication without first consulting your physician. The decision to quit any medication should be discussed with your doctor and with their consent and support.